One of the benefits of using unfractionated heparin (UFH) by infusion over subcutaneous low molecular weight heparin (LMWH, e.g., enoxaparin sodium) is that reversal of UFH can be quickly done and is complete. Although LMWH can be mostly reversed by protamine sulfate it does have a small direct antithrombin effect that cannot be reversed. Furthermore, the subcutaneous adminstration is more difficult to reverse completely. The use of protamine is non-trivial and best performed in experienced hands in a setting where monitoring is available. Usually, if there is a concern of bleeding that is not life-threatening, cessation of unfractionated heparin (UFH) is enough. When given as an infusion, the anticoagulant effect of UFH reaches steady state within 4-6 hours. So on cessation of an infusion, coagulation should be mostly normally after 4 hours. Where UFH is given subcutaneously for the purposes of venous thromboprophylaxis, the anticoagulant effect is more prolonged (but also milder considering the dose used). In the case of an emergency, that is, an acute bleed in a patient anticoagulated with heparin, the antidote is protamine sulfate. This is an index page linking a series of articles on anticoagulation. The delicate balance rages within the human body. At any one time, we are simultaneously at risk from both bleeding to death and transforming into one huge blood clot. The fact that we manage to stay alive at all is quite remarkable. Anticoagulation with a number of different agents and dealing with the subsequent side-effects of our ministrations is neither simple nor done particularly well by many junior medical staff. In particular, warfarin regimens and adjustments of doses are often based more on voodoo and prayer to the warfarin god, than on any basis in evidence. Hopefully, this series of articles will help bring some light to this murky field. More so than many of my other articles, I’ve tried to reference the evidence base for therapy. Warfarin is an increasingly commonly used medication in Australia. It is invaluable as an oral anticoagulant and until the oral direct antithrombin agents (e.g., ximelagatran) (1) are released, it is the only oral medication that can provide “therapeutic” levels of anticoagulation. Unfortunately, with its increased use, over-anticoagulation has become a common presentation to the emergency department. A high INR with or without bleeding complication is not an uncommon scenario for hospital inpatients as well (IMHO due in part due to poor warfarin initiation and management). Do you have any suggestions, criticisms or general thoughts about this website? Or perhaps you have a “wish list” of some topics that you want to go up on this site? If so, post a comment on this page! I’m interested to read what people have to say about “The Medicine Box”. The most commonly used low molecular weight heparin (LMWH) in Australia is enoxaparin sodium (Clexane). The other that is available is dalteparin sodium (Fragmin). Personally, I like enoxaparin. It is easy to use, there is less monitoring required and for the most part, it can be used for most patients. There is good evidence that the low molecular weight heparins are better than unfractionated heparin in many settings where (full) therapeutic anticoagulation is required, e.g., in the acute treatment of venous thromboembolic (VTE) disease (1) and in acute coronary syndromes (2). Unfractionated heparin (heparin sodium) is commonly used in the acute care setting as an anticoagulant. 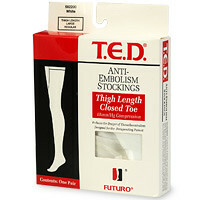 Importantly, it does not contain any fibrinolytic activity so you cannot use it to break down clots (e.g., in lines). Full anticoagulation for treatment of thrombotic or thromboembolic disease (therapeutic dose). Note: updated in June 2009 with the eighth edition (from the seventh) evidence-based clinical practice guidelines from the American College of Chest Physicians. Prophylaxis against deep venous thrombosis (DVT) and venous thromboembolic (VTE) disease is an important part of modern medical and surgical treatment for the unwell or bed bound patient. There is high quality research with high grade evidence for many recommendations. Warfarin is an interesting medication – it saves many lives but causes many problems including some deaths of its own. At present, it is the only oral anticoagulant available in Australia and it is a commonly used drug. Warfarin management, however, is done notoriously badly in hospital. The effective half-life ranges from 20 to 60 hours with a mean of about 40 hours (1). It takes around 3 half-lives to approach steady state and 5 half-lives to reach steady state. That is, for most patients it will take about a week before steady state is reached (and even longer for others). I have seen far too often in hospital people changing the dose of warfarin too rapidly with the result of the INR fluctuating up and down. These forms are probably the ones most commonly used in acute psychiatry where a patient needs involuntary assessment or treatment. They are specific for New South Wales, Australia, only under the Mental Health Act (1990). Click here for more information on the NSW mental health legal system. Schedule 2 for the NSW Mental Health Act 1990. Allows for transport of the patient to a gazetted unit for review by a psychiatrist. Part 2 of the schedule must be completed for assistance from police. Form 1 for the NSW Mental Health Act 1990. Must be given to an involuntary patient and it outlines their rights under the Mental Health Act. Form 2 for the NSW Mental Health Act 1990. Must be completed by at least two people, one a psychiatrist to hold a patient involuntarily.